--- Please Select --- 3/8" 1/2"
Connection screwed bsp male. The flexvent is suitable for venting of air from heating and chilled systems with additives of glycol (max 50%). 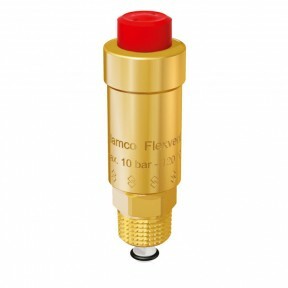 The flexvent is also available with a Flamco air intake preventer to prevent air being sucked into the flexvent during draining. Not suitable for steam systems and closed drinking water systems. Technical data: Max system pressure 10bar, Min system pressure 0.2bar. Max system supply temperature peak +120 deg c, continuous +90 deg c, minimum system temperature -10 deg c.